The Prince of Madinah Prince Faisal bin Salman bin Abdulaziz patronized the closing ceremony of the Naif bin Abdulaziz Al Saud International Prize for the Prophetic Sunnah and Contemporary Islamic Studies at its ninth session and Prince Nayef bin Abdul Aziz Al Saud for memorizing the Prophetic Hadith at its twelfth session organized by the Secretariat For the Madinah Award, in the presence of Prince Saud bin Khalid Al Faisal, Deputy Governor of Madinah Region, and members of the Supreme Authority of the Award Prince Nawaf bin Nayef bin Abdulaziz and Prince Fahd bin Nayef bin Abdulaziz. The ceremony for this occasion started with the recitation of verses from the Holy Quran. Then the General President of the Holy Mosque and the Prophet’s Mosque Sheikh Dr. Abdulrahman bin Abdul Aziz Al-Sudais gave a speech in which he said: The Sunnah is the source of the second legislation, and it has its status and its place in the true religion. And the classification and preservation of the novel and know-how, and the days and years, and may God-Glory and Exalted be upon the Kingdom of Saudi Arabia the founding Imam King Abdul Aziz Al Saud – may God have mercy on him – up the banner of the Quran and Sunnah, and call them and take care of them in every area, Maine Mosques King Salman bin Abdulaziz Al Saud, and His Highness the Crown Prince -ovgahma Allah, pointing out that this country is a revelation, and Mraz faith, and replace the year the Prophet’s care in each area. Sheikh Al-Sudais added: “The Naif bin Abdul Aziz Award, this blessed man who is blessed by God for this blessed country, is the highest banner of the year in terms of competition in which he is aware of God’s mercy on the place of the year and the care and attention to it. In the service of the year of glue, indicating that this blessed award is great in its lofty goals in its great message in its outputs and effects. The attention comes at this time of the challenges of the Prophetic Sunnah in waves of terrorism and sectarian strife and sedition which require all of us to take care of the Prophetic Sunnah. Terrace in each area. The Custodian of the Two Holy Mosques, His Highness the Crown Prince and the Custodian of the Two Holy Mosques, commended the efforts of the Custodian of the Two Holy Mosques, His Highness the Crown Prince and the Custodian of the Two Holy Mosques and the Custodian of the Two Holy Mosques. The King Salman bin Abdul Aziz Complex for the Hadith is a great embodiment of the interest of this country in the prophetic Sunnah. He welcomed the hearts of the believers and acknowledged the eyes of the united Muslims who are keen on the year of Mustafa – may Allah bless him and grant him peace. The Secretary-General of the Naif bin Abdulaziz Al-Saud International Prize for the Prophetic Sunnah and Contemporary Islamic Studies, Dr. Saed Al-Orabi Al-Harthy, delivered a speech in which he said: “It is one of God’s great blessings for people to reconcile them to good deeds and to invest in them. In the Prophetic Sunnah, the second source of legislation comes after the Book of God of great good deeds, which the governors of this country have been keen to serve for the authors of the legislation, the Book of Allah and the Sunnah of His Prophet, peace and blessings be upon him. Levels. Dr. Al-Harthy said that the Nayef bin Abdulaziz Al-Saud Award for the Prophetic Sunnah and Contemporary Islamic Studies is one of the institutions of the Holy Land, which serves the Prophetic Sunnah and contemporary Islamic studies, pointing out that the award has been crowned by Prince Nayef, may God have mercy on him. Youth and girls with their various awards, thus fulfilling their mission in the service of the year and its set of objectives, which created a field of international scientific competition that stimulates the creative efforts in scientific research, builds bridges of cooperation, enriches the Islamic library and highlights the virtues of Islam. Connects emerging young girls and the hadeeth of the Messenger of Allah peace be upon him, educated and discipline and preserved, it estimated outstanding efforts of the owners of a year investigation service and synthesizes, training and technology. He said: “Today we are on a new date of honor for researchers and researchers landed their research vessels on the shores of science and creativity gardens and gardens and pride, and culminated in winning the award, and received the service of the year of the Prophet peace be upon him and contemporary Islamic studies, congratulations to those who won the award, they added a new gorse and good fruit. The Garden of the Prophetic Sunnah and Contemporary Islamic Studies. He went on saying: Our sons and daughters have won the memorization of the hadeeth of the Messenger of Allah – may Allah bless him and grant him peace – and teach him to create his morals and be polite in his etiquette, congratulating them for their victory in the field of honor and honor and following the Messenger of Allah peace be upon him in saying and doing. At the end of his speech, the Secretary-General thanked the Prince of Madinah for his participation of scientists, researchers, young people and girls in their glamor, winning and honoring them in this joyous celebration, which is becoming clearer and more distinguished and marked by the Year of the Messenger of Allah. Their efforts with the prize in the march of Prince Nayef bin Abdulaziz Al Saud to memorize the Prophet’s Hadith for youth and youth. The award was presented by Dr. Iman Azzam, who explained that this award is an extension of the original approach taken by the governors of this blessed country to serve the Quran and Sunnah and its sciences, and that it is for mosques to celebrate in the country of the Messenger of Allah – Peace be upon him – the service of his year, calling on God to reward the rulers of this country Tahir best reward for their service and care and care of Islam and Muslims. The winner of the prize and the competition won the prize and the contestant received the award and received their certificates and prizes. The prize branch for contemporary Islamic studies won the prize of the Prophet Muhammad peace be upon him in crisis management. Iraq, Dr. Rajab Ahmed Hassan from Egypt, Dr. Iman bint Mohammed Azzam from the University of Taiba Medina, and won the branch of contemporary Islamic studies on the subject of “tolerance of Islam in international relations,” a member of the faculty of Umm Al-Qura University, Dr. Mohammed Al-Shammari, The topic of “Interpretation of the legal texts and its impact on the reality of the nation” Member of the faculty of Al-Jouf University Dr. Khalid Al-Sharari. After that, the winners and winners of the Prince Nayef bin Abdulaziz Al Saud competition were given to memorize the Prophet’s Hadith at its 12th session. On their behalf, the student Hassan Al-Shihri expressed his thanks and gratitude for the great pride he received with his fellow winners. Nayef bin Abdul Aziz and honors his place and weighs in the service of the Sunnah of the Prophet’s balance, and bless the mandate of this country, pure and dignified. For his part, the executive director of the award, Dr. Mesfer Al-Beshr, said that this award has been an extension of the attention of the Custodian since the time of the King Abdul Aziz – Ta’eebullah – to this day, the founders of the legislation are the Holy Quran and Sunnah purified, Prince Nayef bin Abdul Aziz, may God have mercy on him, adopted an international award for the Prophetic Sunnah and contemporary Islamic studies. 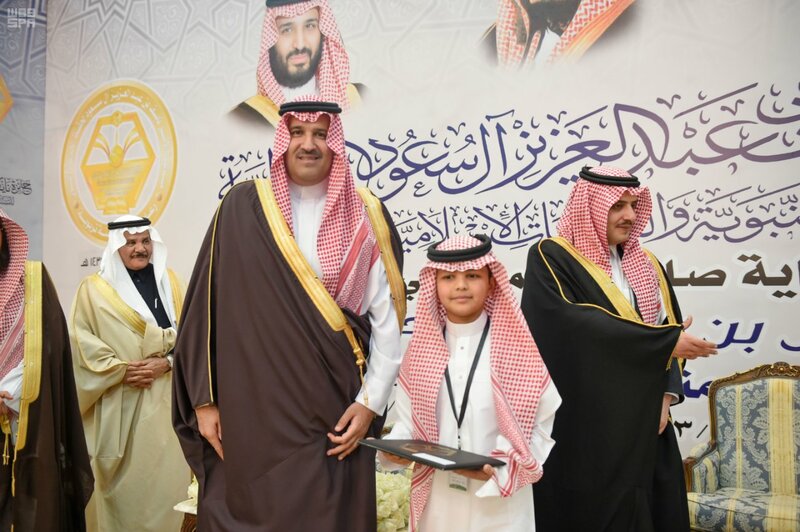 The prize was awarded to Prince Nayef for the Prophetic Year and Contemporary Islamic Studies. The award is dedicated to the scientific research of academics, scientists and researchers from all over the world. And the second prize Prince Nayef bin Abdulaziz for memorizing the Prophet’s Hadith, and this prize for young and young boys and girls from all levels of education, and this was a generous parental gesture from Prince Nayef bin Abdul Aziz – The third prize came in recognition and appreciation of Prince Nayef bin Abdul Aziz, may God have mercy on him – for scientists and researchers, who served the Sunnah of the Prophet, namely, authoring and investigating the teaching sector and in modern technology, He did The Prince Naif bin Abdulaziz Award for the Service of the Biography of the Prophet, and these three awards have become, thankfully, serve the Sunnah and serve contemporary Islamic studies at home and abroad. The international award and its outstanding themes, which address the problems of the times and calls for moderation and moderation and And looking for solutions through the Sunnah and this is a general description of the awards, and the celebration today Prince Nayef bin Abdulaziz International Prize for the year of the Prophet and the Prince Naif Competition for the conservation of the Prophet’s Hadith, and this year for the global award 200 researchers from all over the world M, won the prize winners of five Saudis and three Iraqis and an Egyptian, while Prince Nayef bin Abdul Aziz contest to save the Hadith came more than 30 thousand students and won by 15 students and 15 female students. Dr. Al-Bishr pointed out that the international award is dedicated to researchers and scientists from all over the world, and does not look at the researcher even if he is presented to the non-Muslim award. He is the author of this research with a true scientific approach and passed the arbitration. He wins the award even if he is not Muslim. Not for researchers. He added that he announced the subject of the next sessions which are presented in all media and is on the site of the award and is available to researchers and scientists.